The fast growing, but relatively small and niche, gourmet retail market in India faces multiple challenges that impact retailers' overall operation across the country. Absence of an effective supply chain network and heavy costs of hiring specialist logistics and supply chain management (SCM) companies or a third-party logistics (3PL) firms are a few of these challenges. For a gourmet retailer, including the leading names such as Godrej Nature's Basket, Le Marche, Gourmet Food Bazaar, Ruci & Idoni, Q Mart and Modern Bazaar, maintaining the supply chain integrity and preserving the shelf life of chilled products such as cheese, chocolates, butter, spreads and frozen products such as ice creams is critical and challenging. Setting up a cold storage facility for storage and transportation of these kinds of products, though, is a capital-intensive business, and this is one reason why most gourmet retailers are not interested in investing in them. The investment made in setting up an in-store cold storage facility depends on the size of the store. 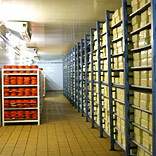 The cold storage equipment levels are determined by the size and space allotted for chilled and frozen categories. Some popular in-store cold storage equipment includes multi-deck chillers, vertical freezers, and serve over chillers, etc. “Nature’s Basket stores usually have 3-4 serve over chillers, 2-3 open multi-deck chillers and 3-5 vertical freezers,” he added. Mohan also says the temperature (in chillers and freezers) need to be pristinely maintained and monitored and there should be suitable back-up (equipment/space) to take care of equipment breakdown. The fruits and vegetables should not be exposed to too much air conditioning in store; as they tend to dry up the products. The fitment of A/C vents should be designed accordingly and they need to be maintained regularly. Even cleaning of all equipment needs to be done using only prescribed materials and at a predetermined frequency. Use of refrigerated vehicles and delivery systems by gourmet retailers are still at a nascent stage; so most retailers depend upon SCM or 3PL service providers for their cold storage and transportation needs. Some of the leading supply chain and logistic firms include TCI-SCS, Gati Ltd, Safexpress Pvt Ltd, Snowman Frozen Foods Ltd, Adani Agri Logistic Ltd.
“At Godrej Nature's Basket, in-store storage is done through dedicated chillers and freezers. However, to ensure that storage, transportation and supply of chilled and frozen products is undertaken in a manner that ensures product integrity, we carefully select our suppliers. Many of our suppliers tie up with specialists 3PLs such as Snowman. They use refrigerated trucks, vans, containers for transporting perishable products. Surface storage options are often limited to refrigerated warehouses,” said Mohan. “Due to growing competition, a few leading retailers are setting up their own cold storage facilities, but the cold chain facilities are still fragmented and hence 3PL providers will continue to play a major role in India,” concluded Mohan.